Oculus Rift no audio left or right, possible broken ribbon on right side, solutions, fixes? In doing this i think it killed sound altogether.. i hope that is all.. Given this.. is there a way to fix this ribbon or get sound back to the existing headphones.. or am i just as well off to add another bluetooth headset somehow, jury rigged ontop? (any suggestions there too).. Actually.. wouldnt using third party headphones lose spatial tracking ability that the built in ones have? I only ask about the ribbon too because i thought i read somewhere it might affect tracking somehow, being broke? (not really sure how to fully open the cracked part of the sliding area to see both ends of the ribbon and work on them either). Thanks in advance (i assume there is no out of warranty service available either). If your phone camera is able to see IR, use it to look at the back of the head band. It will tell you if the LED's are affected too. Outside of warranty, there is no service, no parts and no repair providers. Maybe you could check ebay for broken HMD's. The side strap starts at about Step 16. Most phone cameras do see the LED's, just try it. Nothing special req'd, turn on the camera and point. The only ones that won't see the LED's are those with an IR Filter on the lens. 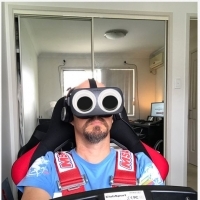 I have the same with my Rift. There is no fix. If your Rift is still under warrenty send it back. If it is not under warrenty buy a pair of wireless headphones and mirror the Rift sound. Yes to the headphones but the rear sensors being offline isnt hugely desirable.. i'm still checking with their support though.